With a special introduction by Matt Wittmann, Curator of the Harvard Theatre Collection at Houghton Library. 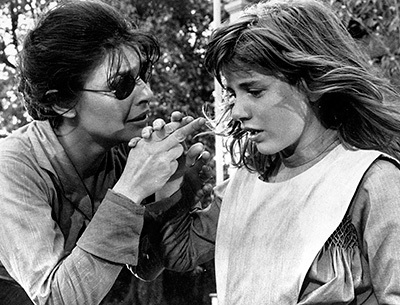 William Gibson’s teleplay The Miracle Worker, based on the early education of Helen Keller under the tutorship of Anne Sullivan, originally aired on February 7, 1957. Arthur Penn directed both the broadcast and its Broadway version. Gibson himself adapted the play for the movie version, bringing renewed acclaim to himself and Penn. The film beautifully captures the tenderness and terror that united Keller and Sullivan, played with great sensitivity and power by Patty Duke and Anne Bancroft. The Harvard Theatre Collection, a department of Houghton Library, acquired in 2013 the William Gibson archive, which documents the full career of this American playwright and fiction writer (1914-2008). This archive contains heavily revised typescripts from every step of the play’s evolution from telescript to stage script to movie screenplay. Included in The Miracle Worker folders are a two-page typescript of Helen Keller’s notes and corrections to the play and a letter (1957) from Keller to Gibson, thanking him for his work.